From Twitter to LinkedIn to Instagram to Facebook, the world of social media can quickly become intimidating and leave you feeling overwhelmed. But once you relax and poke around the sites, you will soon see that there are many benefits to using social media both for personal use and for your business. Here we will go over some ways of using social media that will benefit you (and also a few that might cause some harm). Ready to jump into the realm of social media? Lets go. Whether you are promoting a small business or looking up old friends from way back, there is no better way to get either of these things accomplished than by using a social media site. With sites like Pinterest, LinkedIn, and Facebook, you can easily make new friends, connect with old ones, and build business networks. These connections can really help you with a lot of things, from locating assistance for a problem to seeking out new employment. It is also a great way to get quick and personal feedback, such as career or personal advice. A great benefit of social media as a world connection is the ability to quickly find a group of people who share a common interest with you. If you love a certain author or playing board games, there are groups on all social media platforms that you can reach out to for great discussions. Pinterest is a great platform for this, as users can look up a new hobby or decorating idea and come up with hundreds of websites or blogs from people that have done or want to do the same thing. The possibilities for connections you can make around the world for anything you may be looking for is endless with social media. 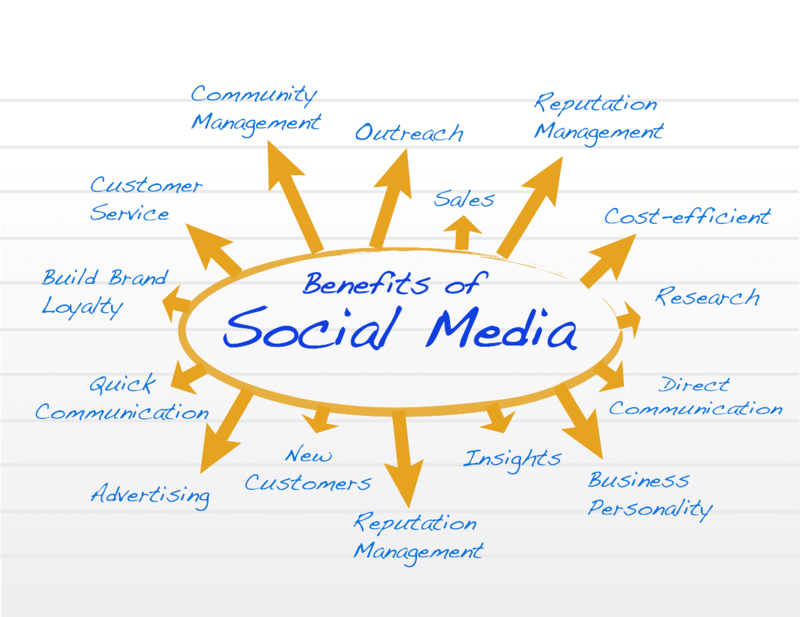 Another benefit of social media is that it has a treasure box of benefits that can help you start up a business and help it grow. By using social media, you can learn more about your customers, engage with an audience at any time of day, and extend how far your brand reaches others. If you want more information on using social media for your business, check out Virtual Market Advantage’s other blogs. This one goes over how to generate high-quality leads for your business online, and this one shows how to promote your content through social media. If you are promoting your own business or a non-profit group that you are working with, one benefit of social media is that your message can be placed in front of millions of people 24 hours a day. Social media can be used to spread your message for free, but there are also advertisement options available for a small fee. This is best if you want to deliver your content to the people with the most potential interest in what you are promoting. Depending on the social media platform you use, there are different tools open to you that help maximize your targeted reach without paying a maximum fee. As the saying goes, sometimes you have to spend money to make more money, and this is true for social media advertising. Running these targeted ads allows you to specifically target your demographic with everything from a person’s location to interests and even their online behavior and connections. If you opt for this fee-based advertising, another benefit is that most of the platforms allow you to track and measure the performance of your ads, so you know if the money you spent is working or not. In 2015, a study done by the research institute by MH Global showed that world-class companies rated the use of social media as the most effective way to identify new business opportunities. Nearly 75% of companies that used the benefit of social media for sales reported a noticeable increase in sales within 12 months. Geo-targeting is another aspect of social media marketing where not only can you reach a target audience that would be interested in your product, but you can target your audience based on location. The benefit of this tool on sites such as Twitter and Facebook is that it allows you to communicate the right content to your audience. Using tools like Hootsuite, you can also target specific Twitter messages to followers in specific countries or send messages from LinkedIn and Facebook company pages to specific groups based on demographics. Hootsuite also allows you to use geo-targeting to find conversations that are relevant to your brand. Another great benefit of social media is the endless ways to increase the spread of your brand and awareness of it to your customer base. Social media makes it easier for potential customers to find and share your business with others. One study showed that that 53% of Americans that follow brands on social media platforms are more loyal to those brands when making purchases. Another benefit of social media is the huge amount of data you can collect about your customers in real time. In a single day, there are over 500 million tweets, 4.5 billion likes on Facebook, and 95 million photos and/or videos uploaded to Instagram. These are staggering numbers, but there is a huge amount of information about your customers hidden within those numbers. If you use the right analytics tools, you can gather data about who your customers are and how they feel about your brand. With daily active engagement, you can gather relevant data from your customer base that can lead to helping you make better business decisions in the future. With the good there always lurks the bad, and while most businesses can find and correctly use the tools to help their companies grow, there are a few things that will make the use of social media a headache for you and your business. When any potentially offensive content is posted online, there can be excessive and brutal feedback. This can be especially true with highly opinionated subjects like religion and politics. If you are going to post things like this on a private social media account, be careful if you want to connect your personal and business page. Also keep in mind that even subjects that don’t seem offensive to you can be sensitive topics for many other people. No matter how secure the information is that you put out there on the Internet, it is available to anyone smart enough to access it. If this person is successful in stealing your information and identity, it could be costly to you and your business and make your life a nightmare. Be diligent and careful about what you put online, even if you think you are just sharing with friends. Once it is out there, it is nearly impossible to erase. If you are using a social media platform to promote your business or yourself, be careful to not get sucked into the black hole that is social media. Make sure you stay focused and on course for your end goal. It is easy to get stuck looking at friends’ family vacation photos or watching that new cat video that popped up on your news feed. No matter how you use these tools, there is much to be gained from the benefits of social media. From targeted paid advertising to knowing how to use each platform to reach your target market, social media can help you grow your business fast. Stay focused, pay attention to your audience, get some ads running, and reap the benefits!